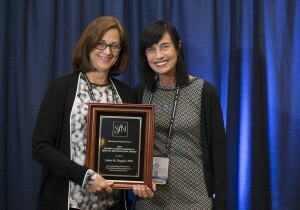 Janice Naegele accepting the award at the Society for Neuroscience’s annual meeting. 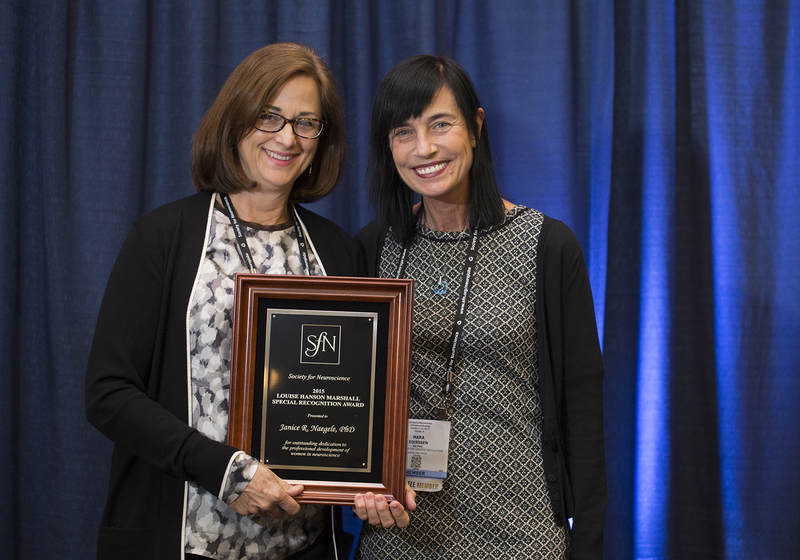 During the Society for Neuroscience‘s (SfN) annual meeting Oct. 17-21, Janice Naegele, professor of biology, professor of neuroscience and behavior, received the Louise Hansen Marshall Special Recognition Award. The Louise Hanson Marshall Special Recognition Award honors individuals who have significantly promoted the professional development of women in neuroscience through teaching, organizational leadership, public advocacy and more. Naegele shares the 2015 Louise Hansen Marshall award with Paul Greengard P’77, P’79, GP ’08, the Vincent Astor Professor at The Rockefeller University in New York. Naegele began her career studying the characteristics of cortical neurons and more recently has performed pioneering studies of transplantation of inhibitory neurons in the brain as a potential treatment for severe epilepsy. She has also been an avid communicator and advocate for the study and treatment of epilepsy. Also, as director of the Center for Faculty Career Development at Wesleyan, Naegele has worked tirelessly to raise awareness about and reduce bias against women in academia. SfN honored other scientists for outstanding accomplishments in mentoring, dedication to the advancement of women in neuroscience, and early-career professionals who have demonstrated originality and creativity in neuroscience research. The Society for Neuroscience is an organization of nearly 40,000 scientists and clinicians who study the brain and nervous system.